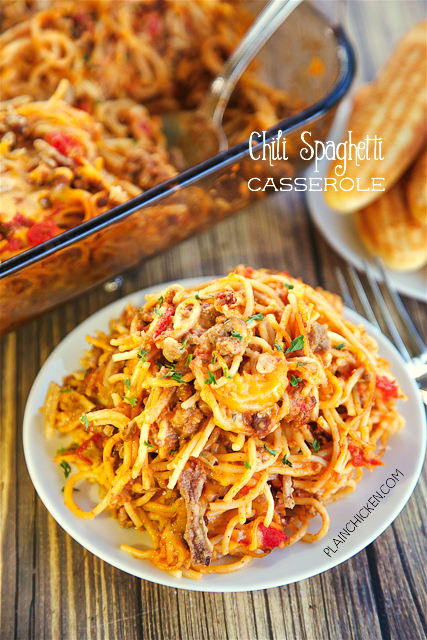 Chili Spaghetti Casserole - comfort food at its best! 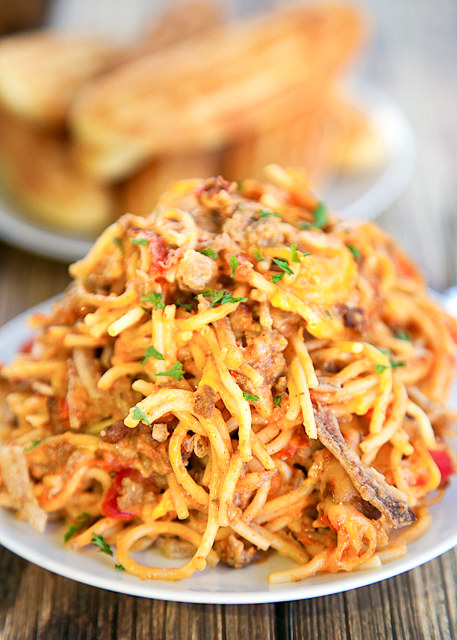 Spaghetti, hamburger, onions, garlic, chili, tomatoes, sour cream, shredded cheese and French fried onions. CRAZY good!!! Ready to eat in under an hour. Great for a potluck and tailgating! Can freezer or later. There are two camps when it comes to chili. Rice or Spaghetti. Chicken Legs is chili and rice guy. I am a chili and spaghetti girl. I love to have some spaghetti noodles in my chili. SO good!! I thought why not make a Chili Spaghetti Casserole. I gave it a shot and it turned out great!! I took a shortcut and used a can of Hormel chili as the base to the chili. I added more meat, spices and some sour cream, cheese and those yummy canned fried onions. It was delicious!! I made some quick cornbread sticks and dinner was ready in about 30 minutes. 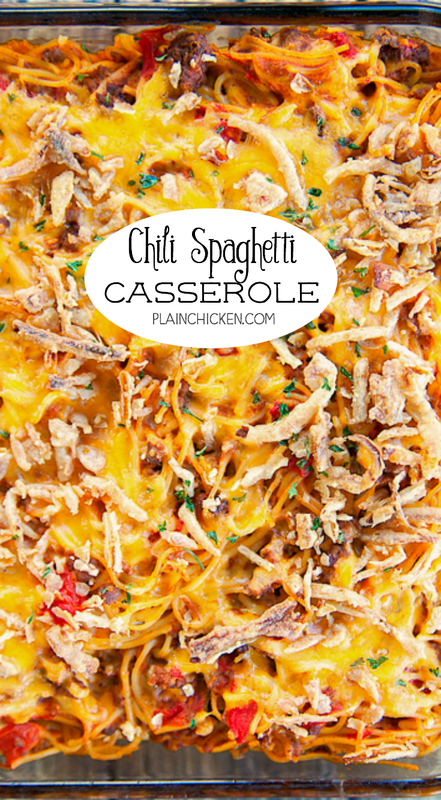 You can definitely make this casserole ahead of time and refrigerate or freeze for later. I actually like to divide the casserole between two 8x8-inch pans. I bake one and freeze the other one for later. 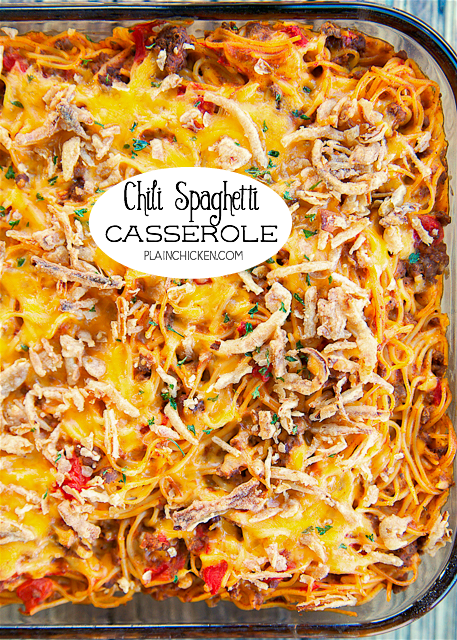 This Chili Spaghetti Casserole is great for watching football! It is also a great potluck dish. Cook ground beef in a skillet over medium heat. Drain fat. In a large bowl, combine cooked beef, onion flakes, chili powder, garlic powder, chili, diced tomatoes undrained, sour cream, and cooked pasta. Transfer mixture to prepared pan. Top with shredded cheddar cheese and French fried onions. What are " friend minced onion flakes"? dried minced onion flakes - in a container on the spice aisle. they are dehydrated onions. We like our chili here in Texas with Fritos! I made a Frito Pie Casserole a few weeks ago - SO good! Sounds and looks great! I’m thinking you could make this in your instant pot. I like to add elbows to my chili (what I grew up with).